He attended the Rhode Island School of Design from 1904-1909 and later taught there. He received a Bachelors of Science Degree from Columbia Teachers College in 1912. He studied art in Italy and was a pupil of Arthur Wesley Dow. 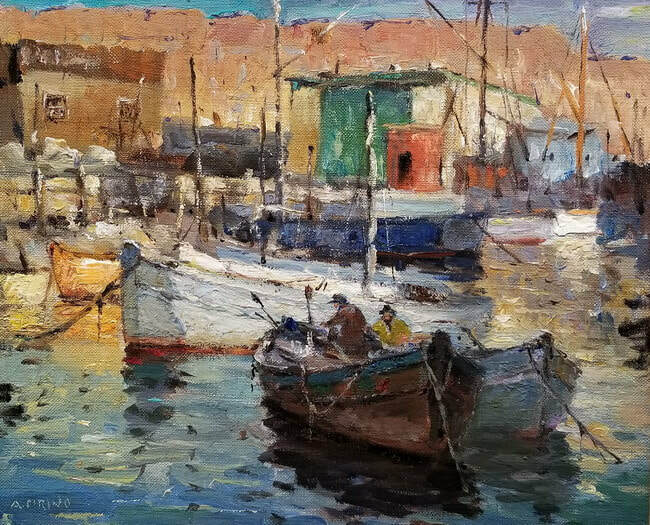 Antonio Cirino was a founding member of the Rockport Art Association, and also a member of the Connecticut Academy of Fine Art, the Providence Art Club, and the Springfield Artists League. Cirino joined the Salmagundi Club of New York City in 1926 as a non-resident Artist Member. He actively contributed to their exhibitions until his death, November 28, 1983. Cirino exhibited extensively throughout his career; the Pennsylvania Academy of the Fine Arts, the Connecticut Academy of Fine Art, the Rockport Art Association, the National Academy of Design, the Rhode Island School of Design. Cirino was the recipient of many awards and prizes from these Institutions. He was a committed plein-air painter, loving the feeling of working directly from nature. He bequeathed the majority of his work to the Rockport Art Association, and it became the cornerstone of their growing collection. Many fine examples of Cirino's work were also bequeathed to the Salmagundi Museum and the Rhode Island School of Design as well.